Warren bid for the job and his price was competitive. He brought in a larger crew than expected and got it all done in one day. He even came back unexpected 2 days later to make sure everything was satisfactory. Warren and Paul have painted several areas of my home (interior and exterior). They are very professional, friendly and clean up the area very well. Warren is very accommodating with his schedule even with last minute requests. I have recommended his service to several friends and family without hesitation. Warren and Paul did a fantastic job of painting my kitchen and hall after some construction. They were efficient, professional, very tidy and much faster than I had anticipated. After this experience, I wouldn't use any other painter and would definitely recommend WG Painting to others. We are extremely happy with Warren, Paul and the work of the team! Just 2 weeks ago, we admired Warren's work at a neighbours who passed his information along to us...I called him the next day and within 5 days, our home freshly painted! We are so impressed by the entire experience. 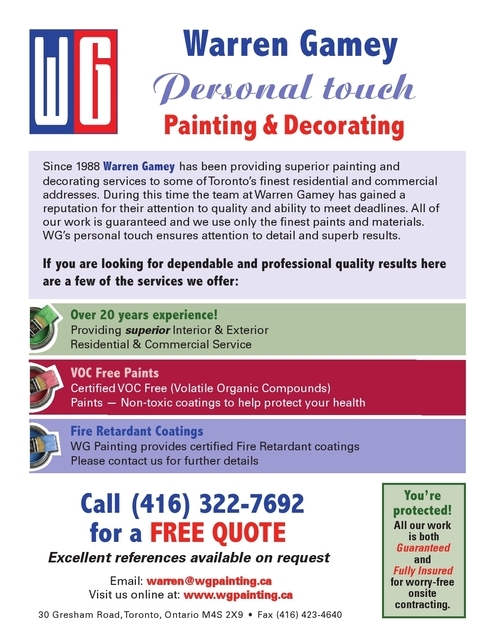 Warren and Paul are extremely professional and friendly and were able to paint our house in a matter of hours causing us little to no disruption - with 2 small children at home, that is SO important! I would highly recommend Warren and his team to friends and neighbours and will call on him in future! We were on a tight schedule, but Warren assured us that there would be ample time to complete all 8 rooms and hallways. He had to work around the 'hardwood guys' and even offered to climb in through windows and such to 'get out of the way'. He and Paul came early and left late when they had to. Unlike the hardwood installation, Warren was prompt, accommodating, professional and finished on time. After this encounter and a couple of follow-ups, Warren has proved to be trustworthy and will always be welcome in our home. Warren and Paul have painted each room in our house at various points over the last 2.5 yrs - each time they have done a fantastic job. There work is flawless. I highly recommend. I am very pleased to report that Warren and Paul transormed the outside of my cape cod. It is looking fresh and happy. Painting brick is tricky business and they did it well. Warren and Paul did an incredible job painting the interior of our house. They are both very friendly, professional, easy-going and efficient. They were very clear about what they would do and provided detailed quotes with very competitive pricing. Once the job was done and we had moved into our house, they came back to touch up any spots on walls that got bumped or marked by the movers, at no extra charge. I highly recommend WG Painting! Everything on the job went as Warren had indicated during the estimate. Work was done well on time and they cleaned up afterwards. Would use this company again for sure. WG painting has an effective and efficient work team. The project was completed quickly. The team kept the work site tidy and was pleasant to neighbours. We will call back for our next painting job.